Honey West is the name of a newer band that has been around for about a year. It features legendary musician ian McDonald who used to play with Foreigner and king Crimson. This band is not classic rock because they have released new stuff. They are a newer band and have been around for about a year. The musicians, are classic icons. The CD is called Bad Old World and quite a bit of it was played last evening, July 15, 2018 at Havana New Hope. 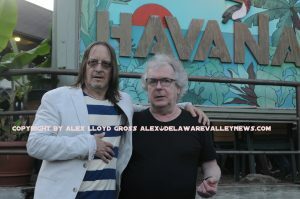 Alex Lloyd Gross Photo- Delaware Valley News.com Ted and Ian outside of Havana, before the show. Fans that were hoping to hear Foreigner songs should realize that McDonald acknowledges that part of his career, but it’s not where he is at presently. He wants you to hear his new music, songs like “The September Issue” and “Old Man”. It’s worth listening to and certainly worth buying. With McDonald on guitar and Ted Zurkowski on guitar and lead vocals, this is a truly special project. The show at Havana was intimate. It lasted about 80 minutes. No elaborate light show, no special effects, just music. It is a special tour for McDonald, simply because he gets to play live onstage with his son, Max, who takes care of the bass guitar. After the show, band members set up shop at a table where they signed autographs for free. They took pre orders for the vinyl release of Bad Old World. Or, people could buy it on CD and have it signed by the band. The emcee for the night was WMMR’s Jacky Bam Bam,. This was the area debut for Honey West. 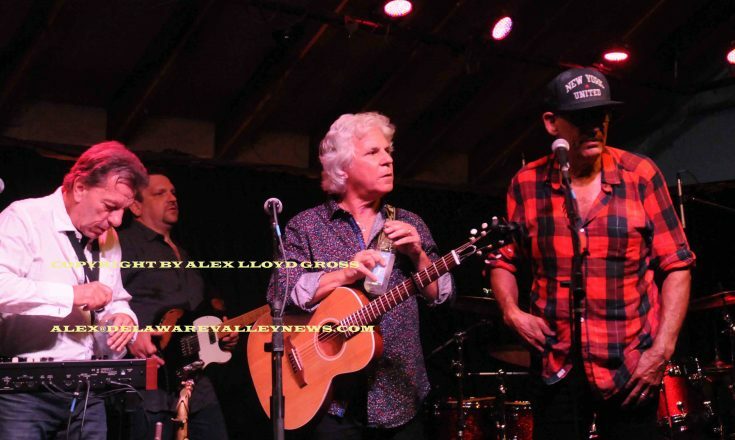 If you missed it, or maybe, if you want to see them again, August 19 they are in Asbury Park at Tim McCloon’s Supper Club.